The red carpet was well and truly rolled out and trodden at the Eye Cinema recently for the Irish premiere of The Guard with stars such as Brendan Gleeson, Pat Shortt, Liam Cunningham, and Danny O’Donoghue from The Script having a ball and chatting the night away during the glitzy after-show party in The g Hotel. Blinded by the camera flashes and hoarse from red-carpet interviews the stars took their seats and it was time to get down to the real business of showing The Guard, a film about a rude, crude, don’t-give-a-damn west of Ireland guard, Sgt Gerry Boyle. They say that ‘some are born great, some achieve greatness, and others have greatness thrust upon them’, well Sgt Boyle certainly is not in search of greatness, he is far too busy taking drugs and messing about with hookers to be actually doing anything beyond the call of duty, however that is until FBI agent Wendell Everett (Don Cheadle ) turns up looking to catch drug smugglers and Sgt Boyle shows there is more to him than meets the eye. Shocked by Sgt Boyle’s outlandish views and behaviour, agent Everett begins the increasingly difficult task of tracking down the gang of drug smugglers - Francis Sheehy (Liam Cunningham ), Clive Cornell (Mark Strong ), and Liam O’Leary (David Wilmot ) - and after being ignored by the locals he begrudgingly turns to Sgt Boyle for assistance. While agent Everett is still trying to figure out if Sgt Boyle is “really, really, smart, or really, really, dumb” the two find a way, with the help of some Guinness and whiskey chasers, to find common ground and work on catching the bad guys. Saying that Sgt Boyle finds the hero within might be a stretch, it seems that it is his mischevious nature, and need to annoy those lads from from the ‘big smoke’, that drives him on, plus the drug smuggling feckers just won’t leave him alone. While packed with side-splitting one-liners the film, written and directed by John Michael McDonagh, still manages to maintain a balance with touching scenes of Sgt Boyle’s struggle to come to terms with his mother’s ill health and be a good son to her. 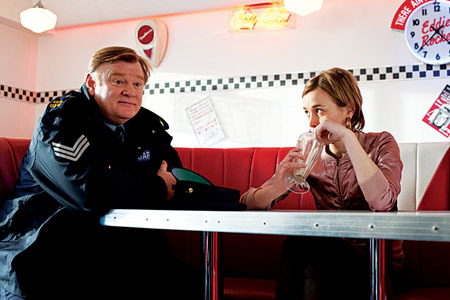 It is the amazing dialogue and Gleeson’s skill at blending comedy with drama that make this film such a hit. When the credits rolled there was a warm welcome for John Michael McDonagh, Gleeson, and other members of the cast who gave a Q&A session before getting a well deserved pint or two in the g hotel where many of the scenes were shot for Sgt Boyle’s extra curricular activities. The star-studded after party lasted into the wee hours with the cast posing for photographs and signing autographs - the autogragh fever caught on with the film’s youngest actor Micheál Óg Lane getting in on the signing action and getting a taste of the star treatment, and long may it continue for the talented Ballindereen native who really held his own on the big screen. Having already wowed audiences at this year’s Sundance Film Festival, The Guard was a big hit at the Irish premiere and could be a real contender for comedy of the year. Twilight Saga: Eclipse at midnight at the Eye!